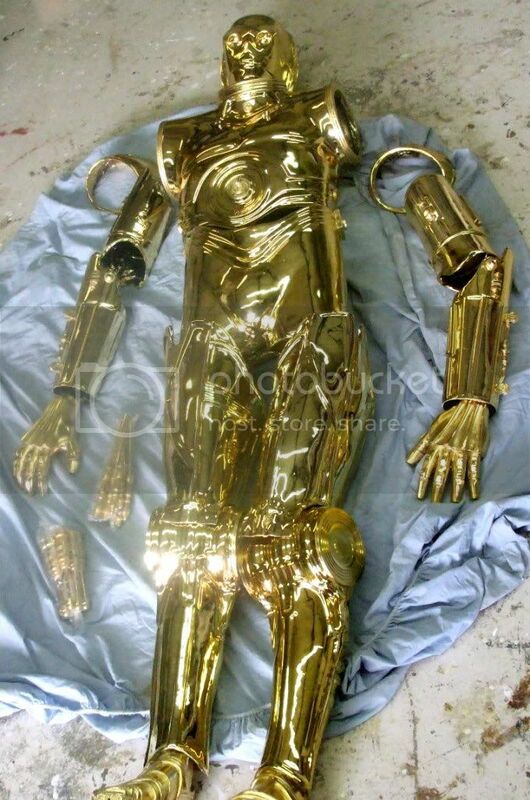 Welcome to the in-depth tutorial detailing the construction of a protocol droid lifesize prop replica. 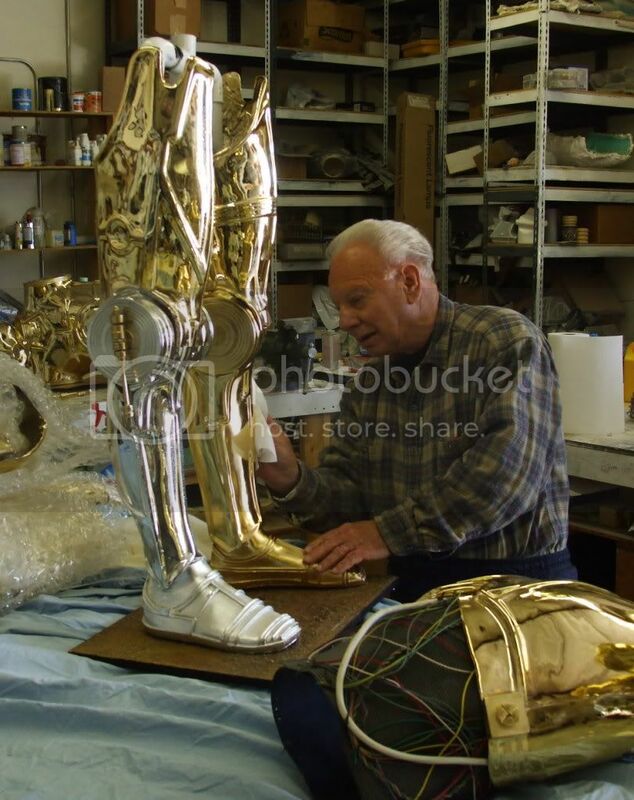 This tutorial will take you through each and every step in transforming the raw untrimmed kit components, into a fully finished gold plated museum quality statue. 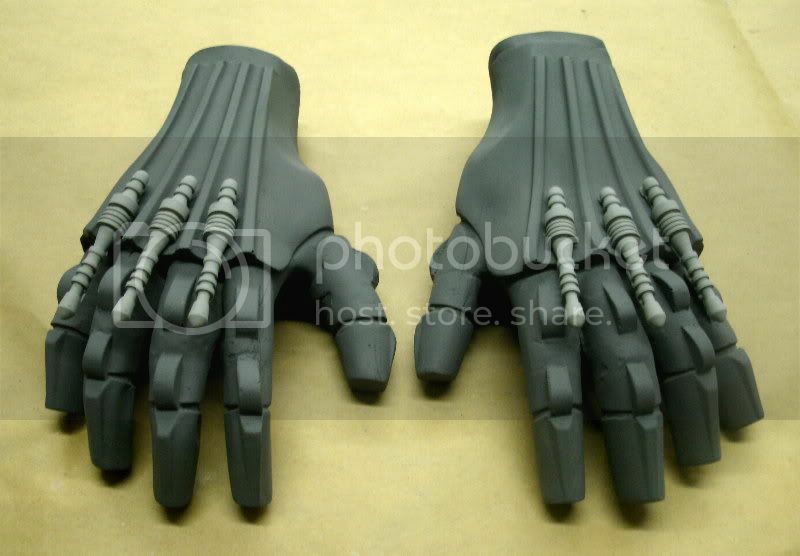 **please note that many detail parts were updated in March 2010 (neckring, arm groove details, knuckle and throat pistons, arm actuators, knee pistons, arm connection mechanics), so some of the base kit photos differ a tad bit. You'll notice that many of the body components of this kit are thermal formed shells that have been designed with missing 'high detail'. The 'high detail' areas are any surfaces that have hard edge ridges, rings, ribbing, piston protrusions, knobs, etc.. 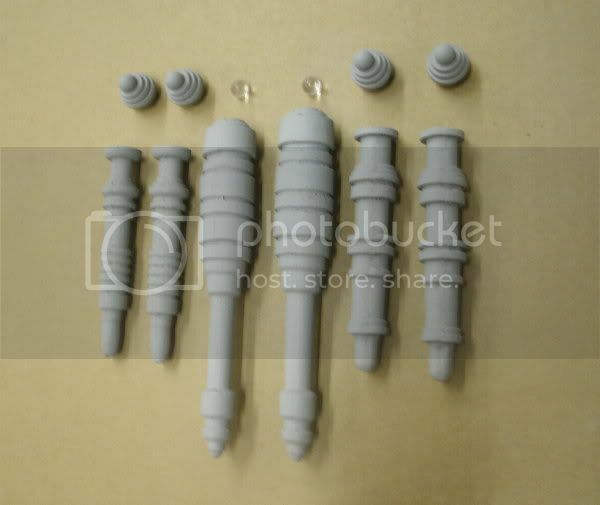 These details are separate hand-cast urethane parts. Once assembled, accuracy is completely maintained. This technique was achieved to assist in the gold chroming process (thermal formed shells are the best substrate for gold chroming processes). 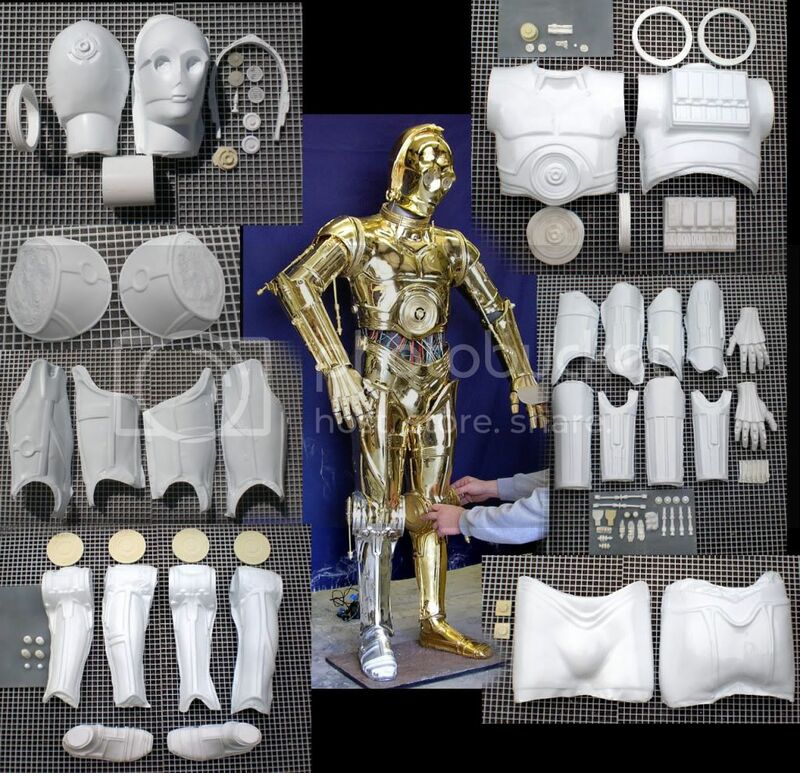 The rundown of the RESIN-CAST components are as follows: Horseshoe head ring, head bolts, head antenna, rear head port, eye grills, eye cups (transluscent), neckring, shoulder rings, both shoulder bells, abdominal ring, chest knobs, hip detail bricks, knee disks (4 total), feet, both hands, and an assortment of detail pieces composing the full piston and actuator sets for the legs and arms. There are 12 main stages of assembly on this kit. Tools needed for these steps include: Belt sander, bandsaw, power drill, sandpaper of various grits, dremel with various bits, CA glue with spray kicker, bondo, pvc cement, gorilla glue. 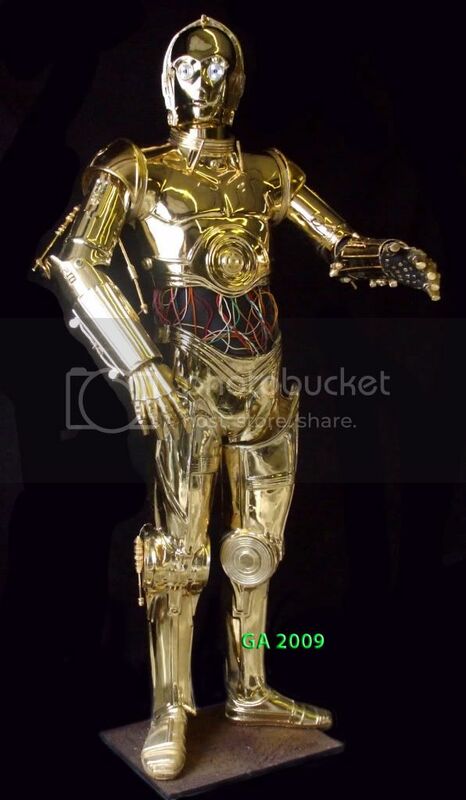 Materials needed (not included in the kit): apoxie sculpt (aves supply), rubber sheeting (ace hardware), wiring (radio shack), mdf board (home depot), 1" pvc stock and 1" pvc joints (home depot), sheet metal, wood screws and bolts (home depot), and 3" magnetic disks (available online). This tutorial is broken down into stages, first depicting the assembly of individual body components, then attaching body parts to body parts where necessary, then final detail assembly where things like 'pinning actuators' and 'magnetic puck assembly' will be addressed. Lastly we'll look at adding electronics and sonic features. 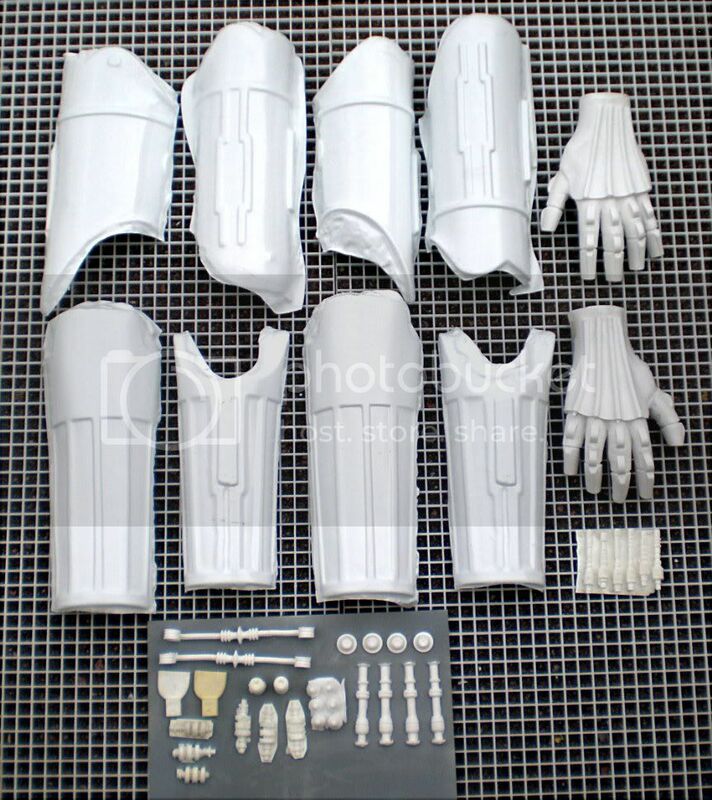 NOTE: **If you are planning on creating a WEARABLE version, you will follow many of the same basic assembly steps, but you will not follow the "final assembly" areas since you want to keep your parts hollow. We'll start with the head and work our way down to the feet. Here we go!!!!!!!! 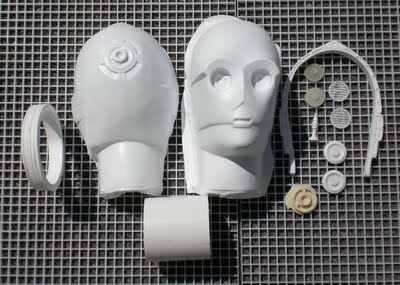 I had previously posted a head buildup tutorial here: www.goldenarmor.com/vacheadtutorial.html so please refer there if you have any questions from this blog. 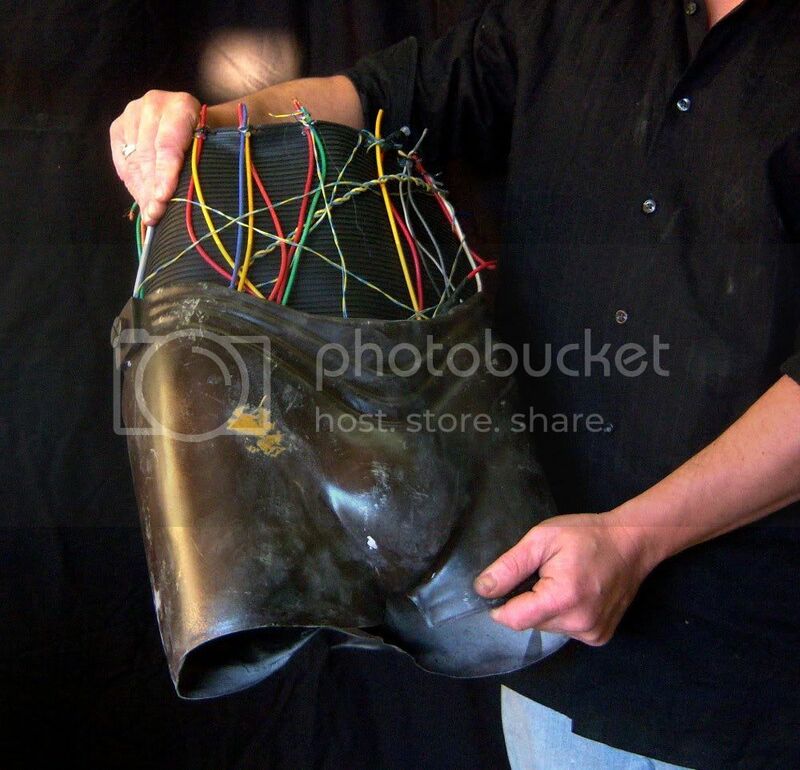 The head kit consists of 2 thermal formed shells comprising the face and back of the head, a horseshoe ring, neckring, 2 neckbolts, an antenna, 2 eye grills, a rear head port, PVC neck, and 2 transluscent eye cups. dremel. Now fill in the gaps with bondo. Now it's time to sand down the seamline. I like to add a piece of painters tape along the crown to prevent inadvertantly scratching the plastic surface. Sand down the bondo until you get a nice even finish. Several layers may be needed so be patient. 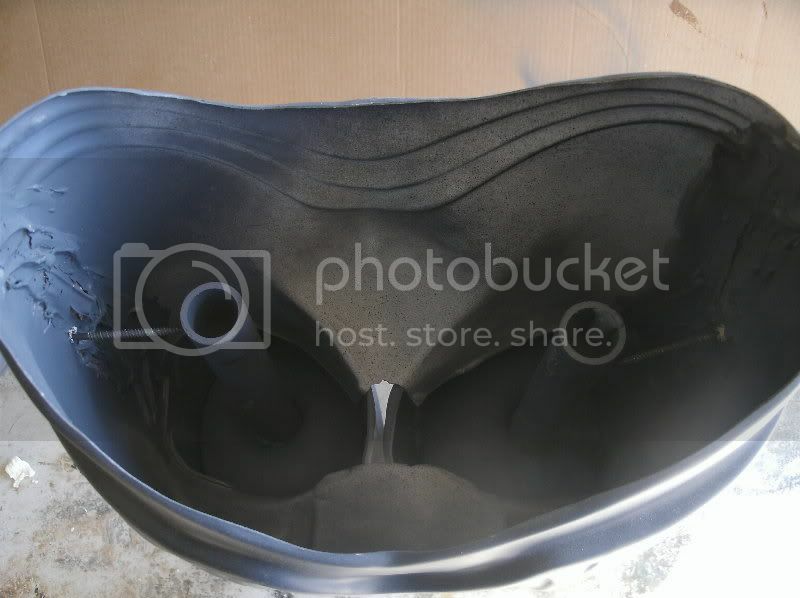 Using the same drum sanding bit, carefully remove the rear headport area to allow the resin replacement port to fit in tightly. Glue this into place from the interior. I drilled a hole in this sample to allow for an on/off switch (optional). When trimming the biceps, you can adjust the width of the final pieces by using a heatgun to reshape the countours. 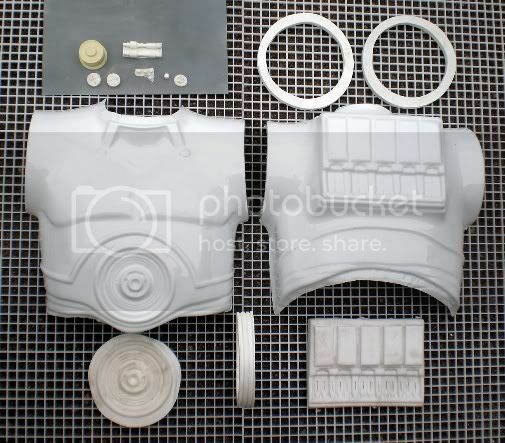 A few of the parts need adjusdment using this technique anyways but if you are going for a wearable suit, you can adjust them in even further to make skinnier pieces. One you have the two shells on each side, user superglue and spray kicker to spot glue them into position. 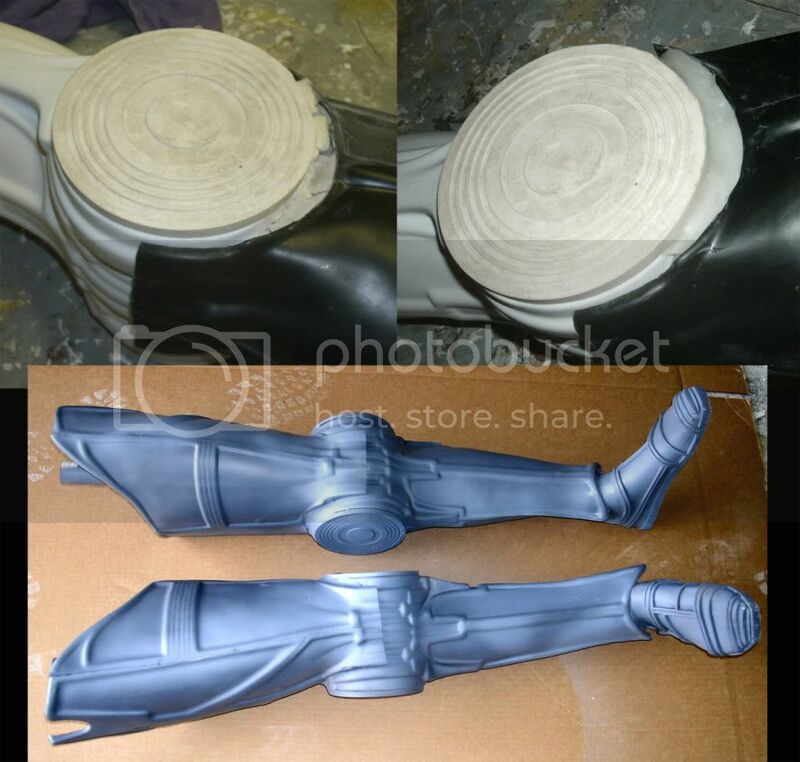 Now cover the interior seamlines with bondo, then PVC cement over the top to adhere the bondo to the plastic. Be sure to wipe off any excess PVC cement as it is caustic to the plastic surface. Once all this is dried you will have a VERY secure adhesion. 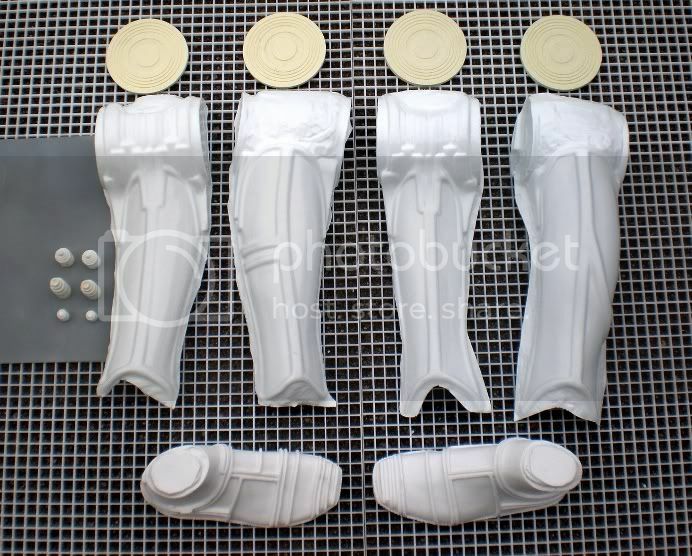 Now use the provided resin cast pieces to add the forearm knob in place, the piston tab, the high piston detail, groove plates, and piston head attachments. Like the biceps, the forearms need a little adjustment and, if you are making a wearable costume, customization to your body size. This is done using a heatgun. Be careful not too apply too much heat at once. Test your heatgun on some scrap plastic before proceeding. Once you are happy with the size, spotglue (CA glue and spray kicker), and hold in position with clamps until the glue is dried. 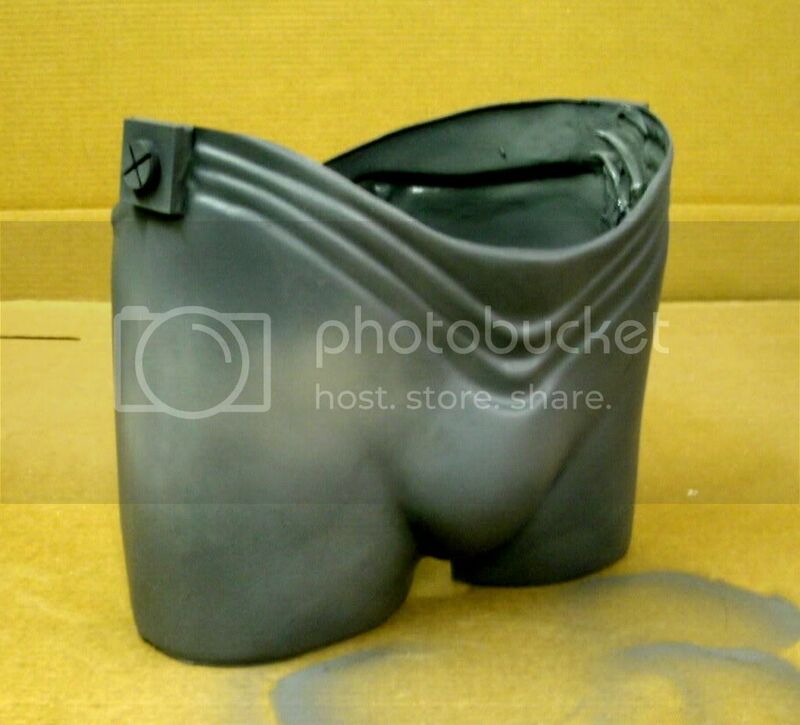 Apply bondo, then pvc cement to the interior seamline for ultimate strength. Next, trim the parts on a belt sander (showing above) and begin assembly using the provided resin detail components. The above photo shows the new groove plates, forearm knobs, and piston attachment pins and how they are assembled on the forearms. 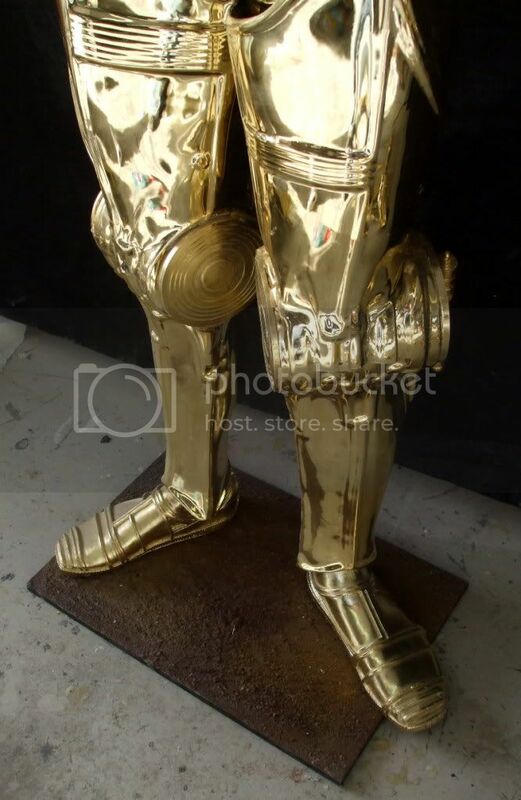 If you are converting this to a wearable costume, you can see that the arms, assembled according to the steps above, need no modifications. They can be custom trimmed and lined with foam for comfort. The INNER arm pistons attach at bicep using a cleaved open end (cleave it with a dremel cutoff wheel). 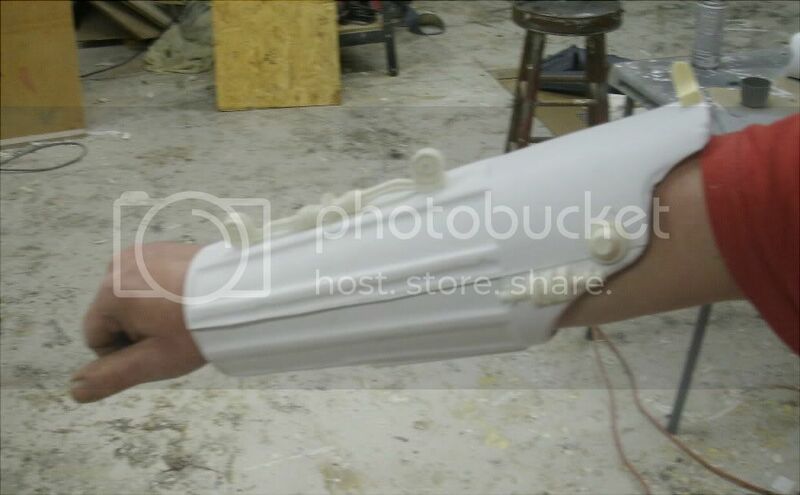 The lower portion attaches at the forearm. The OUTTER arm piston attaches with a cleaved pin attachment at the top, and a tongue and groove attachment at the elbow. I left the piston rods untrimmed at the ends (with removeable attachment knobs). 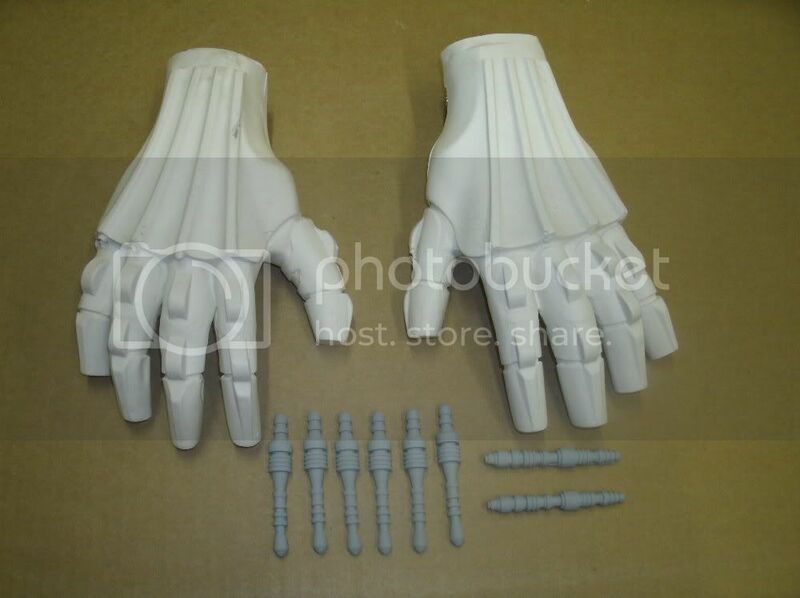 I left them much longer than is needed so I can custom pose the arms once the components are gold plated. Once a desired length is settled, you can trim the pistons, or leave the rods unglued so they are functional (slide in, slide out). March 2010 UPDATE: This is the NEW NECKRING!! Turned by my friend Dennis at his machine shop in Colorado. First start off by trimming the flashing off the sides, tops and bottoms of the trunk shells. When assembling them together, if you overlap, overlap the front over the rear (showing in these photos). Use the shoulder ring and neckring to ensure you are assemblying properly. 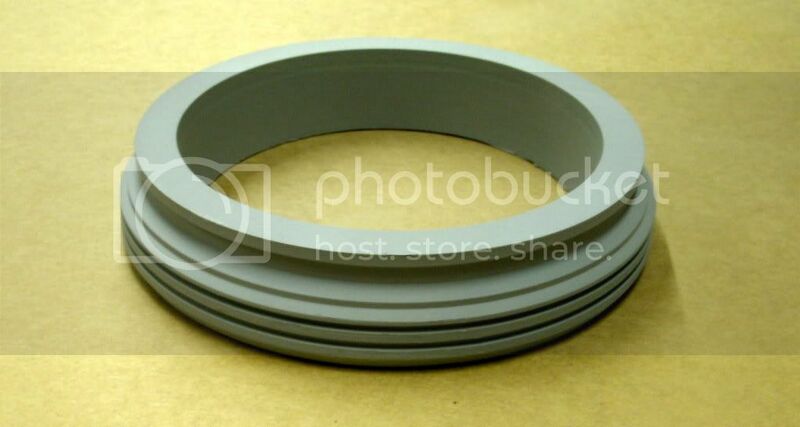 There should be enough room to allow these rings to sit on top of the assembled diameters. Hold them in position with tape and spot glue them with CA glue and spray kicker, followed up by bondo and pvc cement for strength. Note: when you assemble the trunk halves, have one of the resin shoulder rings and the neckring on hand. You can use these to make sure you're leaving yourself enough room for them later. Dremel out the 'belly button' using a drum bit and inset the detail piece from the inside (see above). Use your belt sander to trim down any excess plastic that raises above a flat surface level for the shoulders. The shoulder ring must lay flat. Once you are satisfied with the trimming use CA glue and clamps to hold the rings securely in place and spray kick them to make the bond permanent. The last photo showing above shows the placement of the chest detail pieces. Attach the NECKRING the same way you attached the shoulder rings. Trim the area flat on a belt sander, spotglue the neckring in place, cover the entire area with painters tape and backfill the INTERIOR with bondo to cover any gaps. A combo of bondo and aves apoxie sculpt will take care of any gaps (needed at the rear to blend the neckring into the backplate). 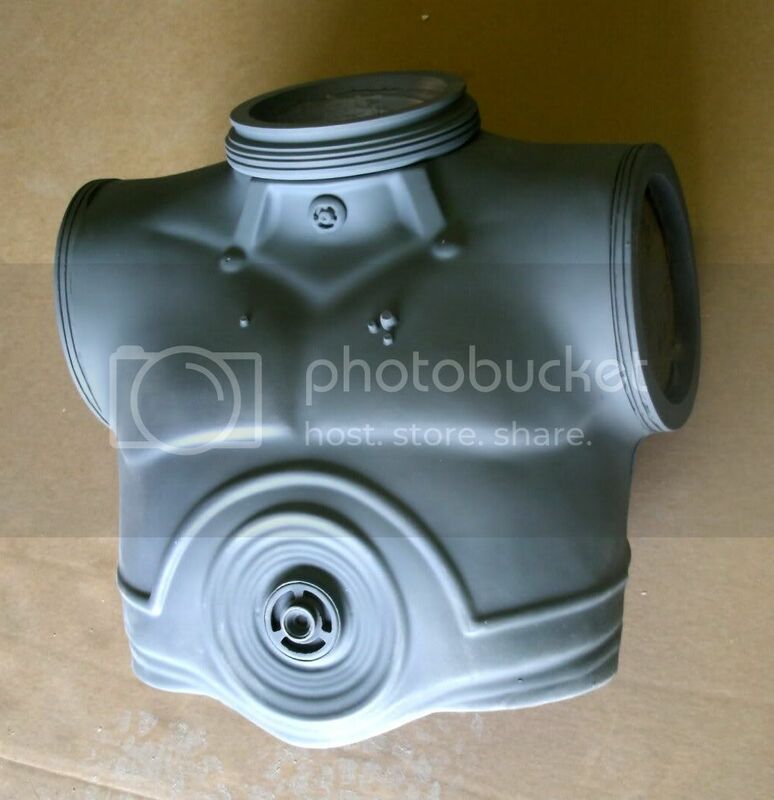 The 2 throat pistons attach like this (showing above). The rods do not lay against the neckring at all, they hover away from them, pointing upwards. Do this by attaching wire to the ends and feed the wires through the throat area. On the interior, bend the wires upwards so the tension holds the pistons up and away from the neckring. Use adhesive to seal their position. The throat medallion can now be glue in place also. COMPLETED TORSO!! 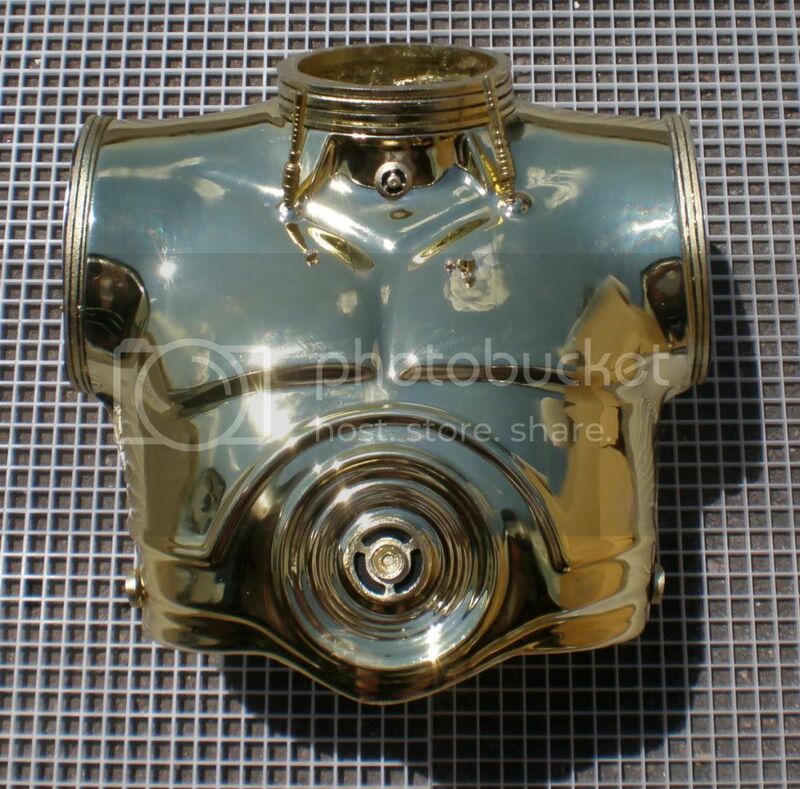 (minus the throat pistons which will be attached after gold plating is completed). The hips are very simple. 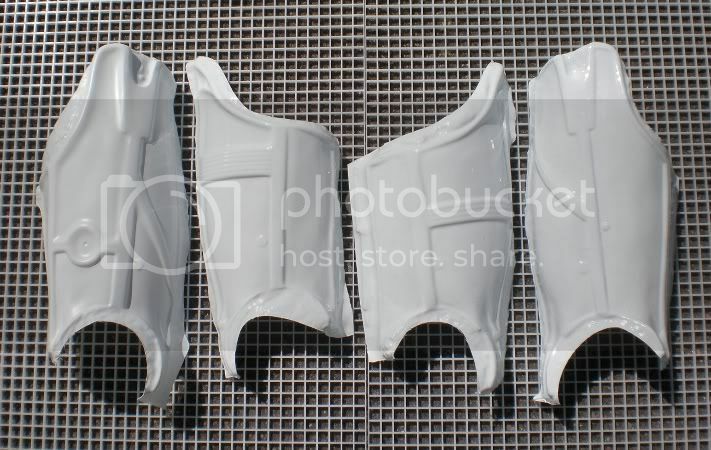 They are composed of 4 parts: Front shell, back shell, and two detail pieces. Start by trimming the flash off the hips. The FRONT overlaps over the rear so leave plenty of flashing when trimming the rear hips. 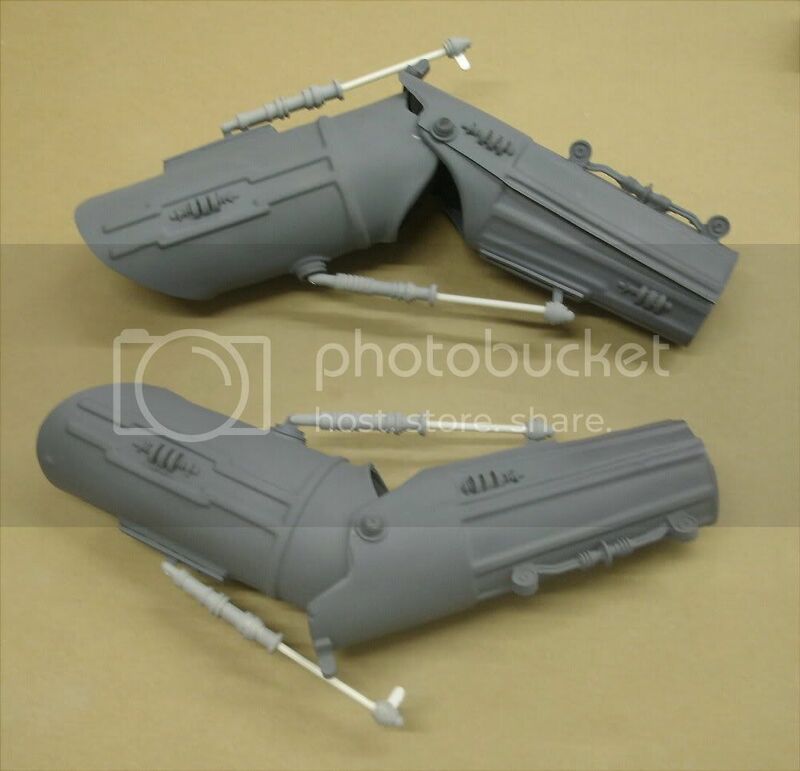 Use clamps to hold the halves together and superglue/spray kick to adhere, then follow up with bondo and PVC cement. The detal bricks are trimmed nad glued on the sides at the tops. 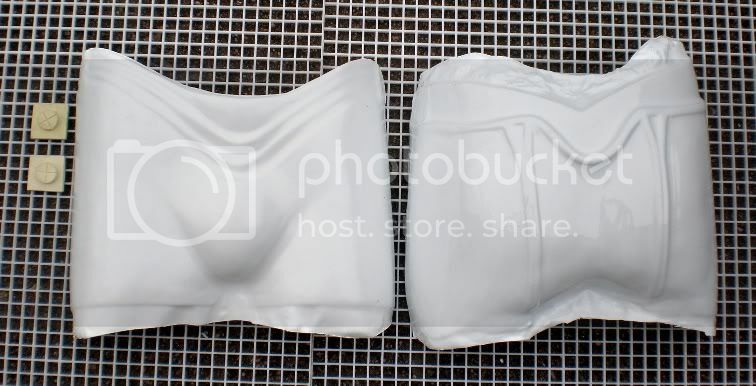 The gaps can be filled with either bondo or aves apoxie scupt (my favourite since you can sculpt it in and reduce your sanding time). Trim the thigh pieces as shown. The trimline is very easy to see on the kit pieces. Fit them together using painters tape to hold them. 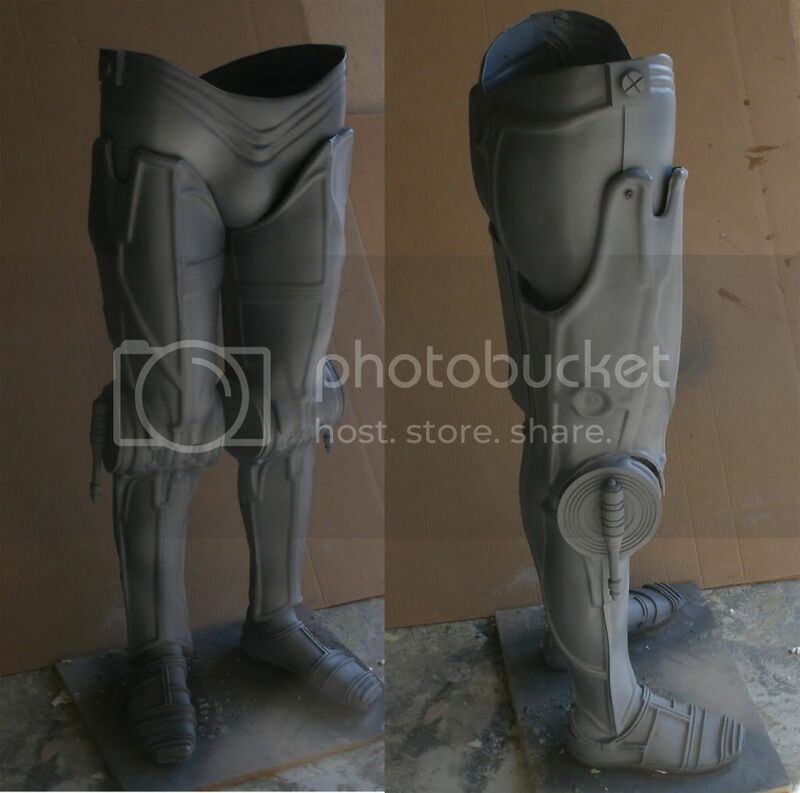 The legs need to be widened a little, and this is youir best opportunity to custom fit the legs to your legs if you are planning on buiding a wearable suit. I used black plastic of the legs shells and white plastic for the rear leg expansion piece to demonstrate how this looks. Spot glue/spray kick them. The SHINS go together just like the thighs. Trim them at the exposed trimline. Assemble the halves where the top overlaps the rear. Adhere using the same steps detailed for the other body parts. Sometimes you will end up with an uneven surface where the knee disks attach. Address this by filling the interiors of those areas with foam, then sand the disk area flat on a belt sander. Then use superglue to adhere the 4 knee disks in place (showing above). Clamps help hold them tightly while the glue dries. Use a belt sander to trim any excess areas (last photo shows trimmed ankle area. The Feet are simple. Just trim the bottom flashing on a belt sander. Now we move onto the ASSEMBLY stages of this project. Now that you have all the pieces assembled as separate body parts, you will need to bring them together to form your display statue. 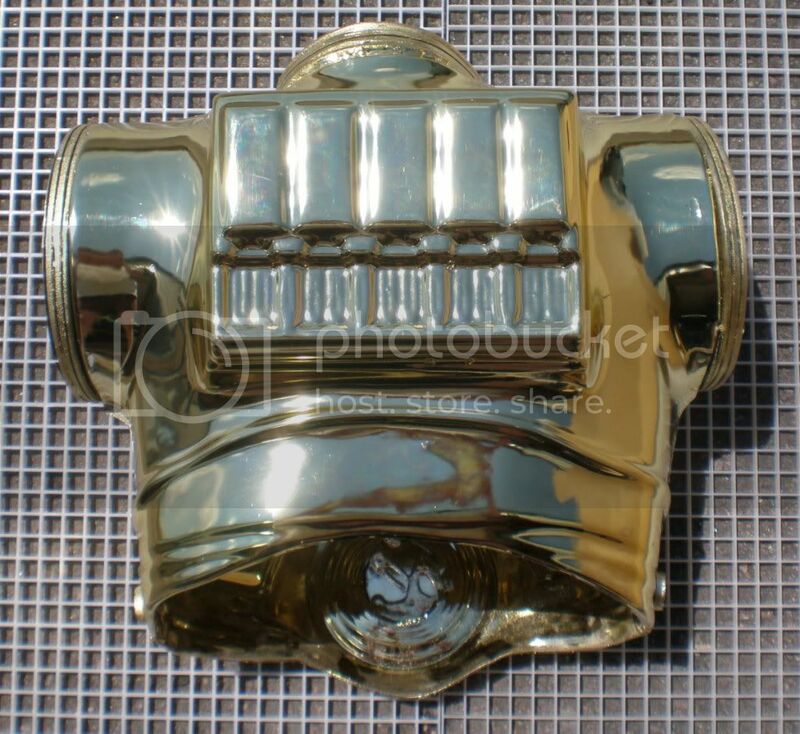 If you plan on gold plating your components, not all of the assembly can be done at this stage. 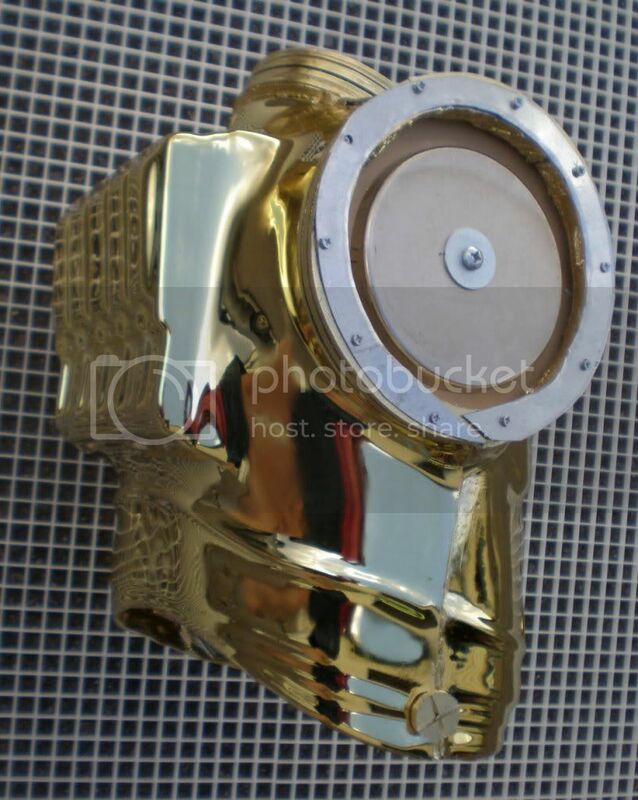 My example on this page shows your assembly process if you plan on going for a gold chromed or painted finish. ***please note: If you are planning on building a wearable costume, you will follow NONE of these steps. Now that you have individual body parts, it's your job to separate the pieces and do heavy modifications to create wearable/closeable shells. Those steps will not be addressed in this tutorial. Soooo.. good luck to you!! Assembly should begin from the bottom up. Once you have assembled a display base (see that section in this tutorial), you can use that to start on the legs. Trim your feet so that a 1" pvc pipe can feed through the middle. 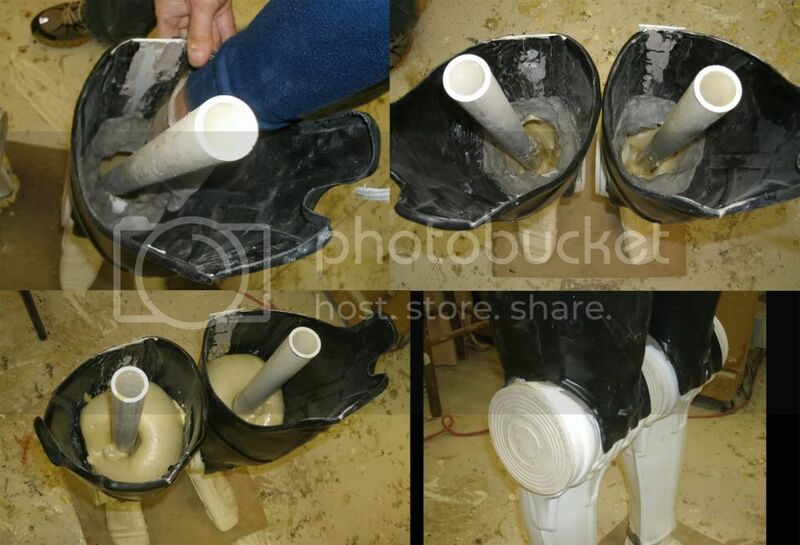 Place your foot over the female pvc joint that's mounted onto the base, and cover the gaps with clay. You don't want any foam seaping through the foot onto the base. 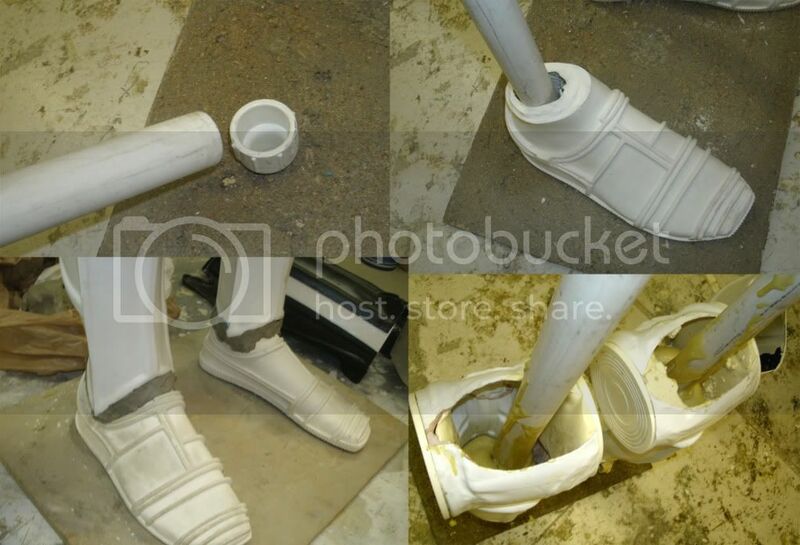 Now insert a 1" pvc pipe into the fitting throug the foot. Measure this pipe to about the top of the thigh (see photos below). You want the seal between the shin bottom and the foot to be pretty much airtight. Do this by using more clay. Once you're happy with the seal, pour in some expanding foam and let it rise. This does TWO things: 1.) It adheres the foot to the pvc pipe, and the shin to the foot. Now do the same steps for the thighs. Insert them into position on top of the shins, trim them where necessary so they sit low down. 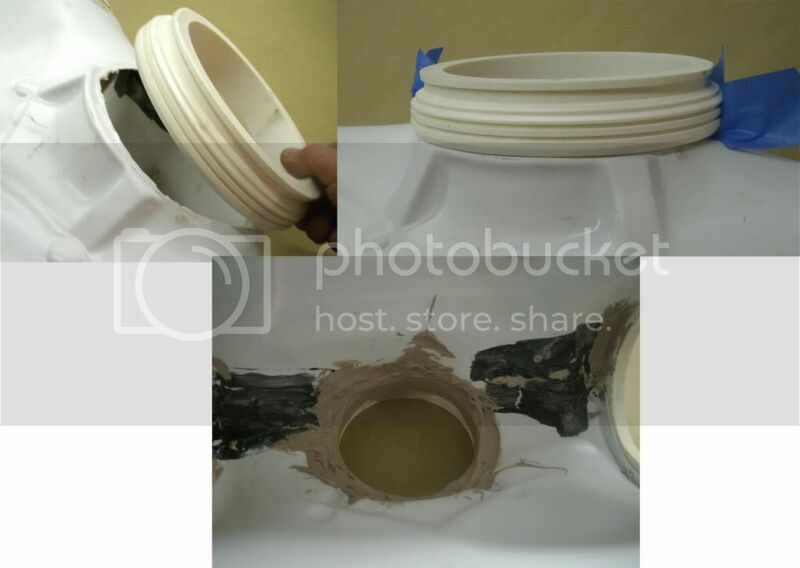 Make the connection watertight by using clay (water based clay is easiest to work with). Once you're happy with the seal, pour in expanding foam. Your result will be thighs that are locked onto the shins which are locked onto the feet which have a pvc interior that locks onto any 1" pvc female joint. The advantage to this is you can mount the statue ANYWHERE you mount a 1" pvc joint. The posts in the interior of each foot can be re-enforced by filling in their connection area with resin or fiberglass. When doing this make sure to leave plenty of slack at the end of the post (where it will attach to your base). Fill any gaps in the knees with aves apoxie sclupt and YOU'RE DONE WITH THE LEGS! Attach the knee pistons using some plastic coated aluminum wire (home depot). If you followed the steps, you'll have two sections of equal length PVC acting as "femurs". 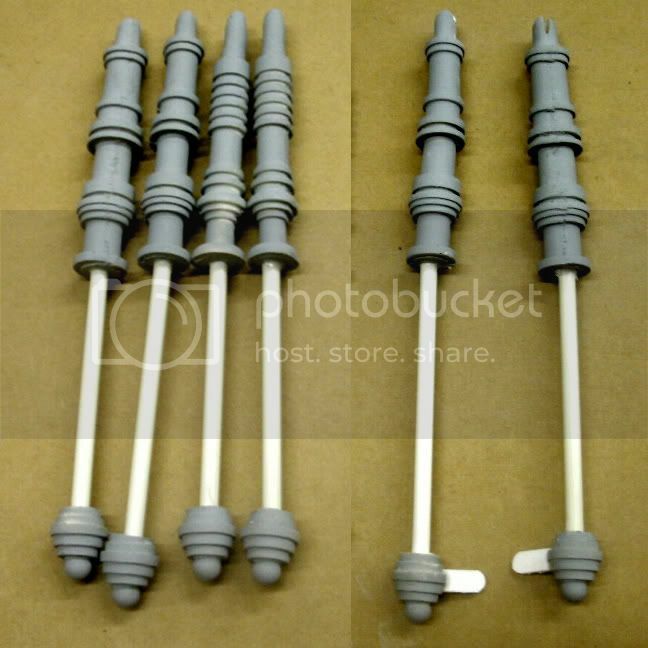 These are firmly connected to the shins, which are connected to the feet, which are solidy planted onto the base (removeable if you twist each leg off the posts). With the hips attached it looks like this when looking down into the hips.